Speed MP3 Downloader is a program that enables to download MP3 songs from the Web. Other features are available and detailed below. As a music downloader, this program enables to search for MP3 files (favorite songs and hits of the year) on the Web and save them directly on the hard disk drive. The process runs quickly but will mostly depend on the Internet connection of the user. Speed MP3 Downloader is hundred percent free from spyware, adware, viruses, Trojan Horses and others. Transfer of songs is protected by a powerful encryption to avoid any malware to infiltrate through them. 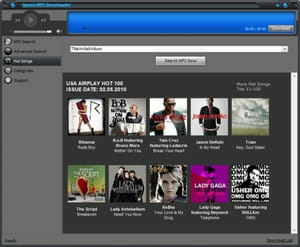 The music information such as artist, title, length, popularity and download links will be displayed on the interface user. Speed MP3 Downloader's interface is eye-appealing, intuitive and graphical. This program is built-in with a simple player integrating all control buttons needed for this purpose such as Pause, Play, Stop, Next, etc. This is making Speed MP3 Downloader quite practical to listen to the music before and after the download. Speed MP3 Downloader is free from viruses and other threats. 100MB download limit for this trial version. Latest update on September 28, 2016 at 04:39 AM.